The Ironman triathlon is the hardest one-day endurance race in the world. You swim 2.4 miles, then cycle for 112 miles and finish off with a 26.2 mile run (marathon). My name is Martin Bickley, I’m 33 and live in Berkshire and in July 2015 I did just that, for Rainbow Trust. 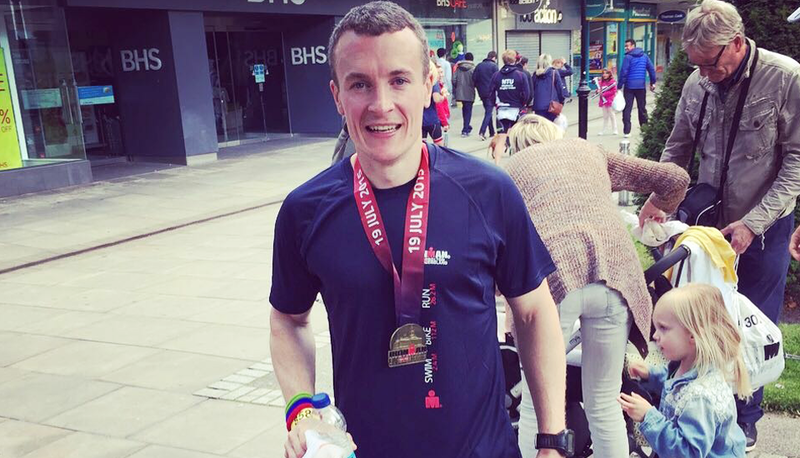 I’d previously done a few 3 Peaks events, had run a few half marathons and completed a half Ironman, but nothing on the scale of a full Ironman. So I decided to sign up for the Ironman Bolton. I had a specific training plan in place for the 10 months leading up to the event. For the final 4 months it was quite intense, most weeks I was putting in between 14 and 18 hours of training, which is quite hard to balance with work and home life. My weekends were totally dominated by training; usually a 6-7 hour cycle on a Saturday followed by a 2-4 hour swim/cycle/run session on a Sunday. My sister Claire manages a team of Family Support Workers at Rainbow Trust, so I get to hear about a lot of the great work the charity does, and can see how the fundraising is put to good use. For example, the ‘sleepover’ some of the children had at the Natural History Museum was such a great thing for them to be able to do, but obviously needed money to make it happen. I managed to raise £1,200 for Rainbow Trust, mainly through word of mouth and social media. I think that as long as you focus your message on the good work the charity does and why it’s needed, people tend to be very generous and want to support your efforts. More than anything I felt relief crossing the finish line! It was also a bit emotional as all the training, fundraising, having to eat ‘properly’ etc. that had dominated almost a year, had all come to an end. It was great having my family and friends there to celebrate with too, including Claire. The support I had throughout, from family and friends and even people I don’t know, was quite overwhelming.